After a wonderful day in Rome’s delightful Borghese Gardens, we walked toward Via Veneto to find something to eat. I looked up and suddenly rising before me, right in the middle of a 21st century city, stood the brave Aurelian Roman Wall, constructed around 275AD, almost 2,000 years ago. Behind the wall I saw buildings from the 15th century Renaissance, which still gives the city much of its beautiful flavor. Contrasted with that was modern day technology: people talking on their cell phones, carrying plastic grocery bags, and taking digital pictures of it all. It’s not a great picture (I wasn’t interested in photography at the time) but that moment, more than any other on our trip, caught me up in the clash of culture and multiple warps of time that is my beloved Roma. 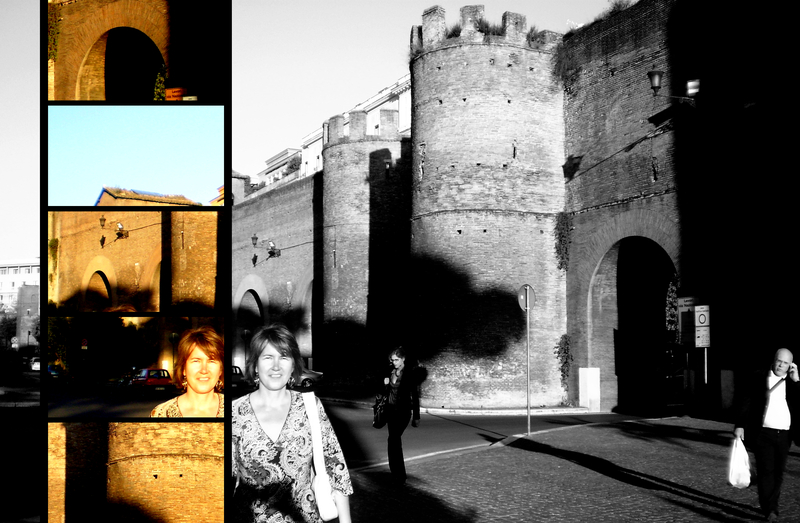 Indeed, Rome is a place where many cultures and ages intersect. We are so “young” here in the U.S. And thank you for following! I’m glad I’ve found my way to your site; you have some lovely images! Thank you for your kind comment and following, too! It’s very nice to “meet” you and see your work!